Round Balls No. 12 clone found! I came across another page of The Ever Continuing Saga of the Round Balls, this one from June 1986. It claims to be No. 12, making it the second unfinished No. 12 out there. I can’t even blame a printing error on this one. Maybe I lost the other one and started over. This Round Balls comic is noteworthy for the fact that the Round Balls do not actually appear in it. I’m not sure where I was going with this one, but I do like the stick man. He seems very business-like. I thought I was very hip at the time by dissing on both Nancy and Doonesbury. Here are the two remaining Mac and Tosh strips from the fantastic but short-lived Mac and Tosh Comics collection. The first, “A very merry quite contrary scrumpdilliishus meal” starts with a title that makes little to no sense then segues into a heart-warming tale of love and acceptance in which Tosh gains weight in order to match the ample size of his girlfriend. Although it reads today like an affirming take on accepting people for who and what they are, at the time I probably just found fat jokes hilarious. I was an easily amused kid. 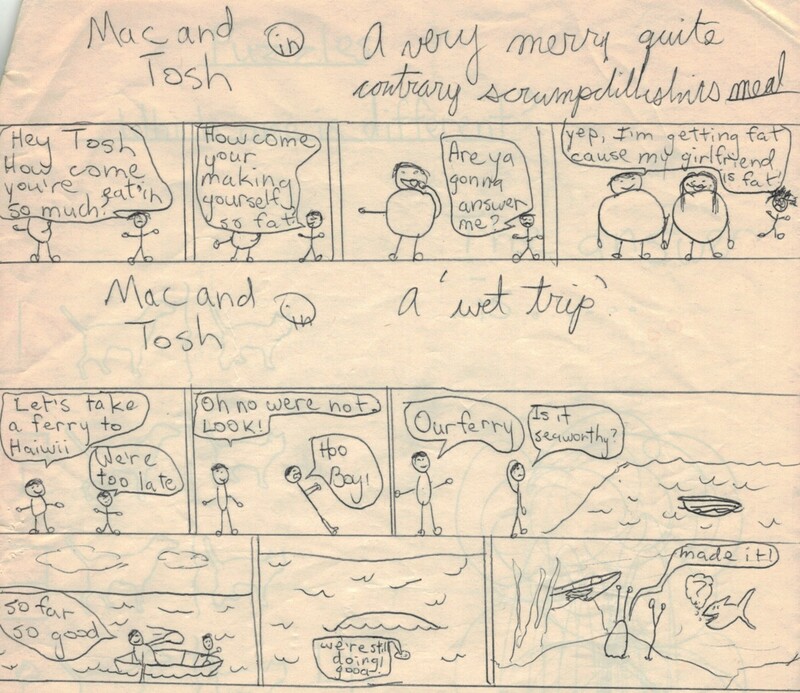 The second strip, “A ‘wet trip'” is very much accurately titled, as it recounts Mac and Tosh’s disastrous attempt to boat to Hawaii. I apparently did not have a dictionary handy to confirm how to spell “Hawaii.” Or a lot of other words. Even in the few strips presented you can already see how Tosh is always optimistic, even in the face of tragedy and despair, while Mac is constantly skeptical and cynical. How very odd couple! I didn’t actually watch a lot of The Odd Couple, though its theme of “opposites attract” obviously resonated with me for some reason. If I had to speculate it probably began when I sat down and asked myself, “How can I do a comic with two stick figures but make them look different? I could give one a hat. But hats are tricky to draw. I know, one will be less stick-like than the other. Genius!” And from there the personalities of the two practically wrote themselves. I like the puzzled fish at the end, likely reflecting the take of anyone reading the comic. 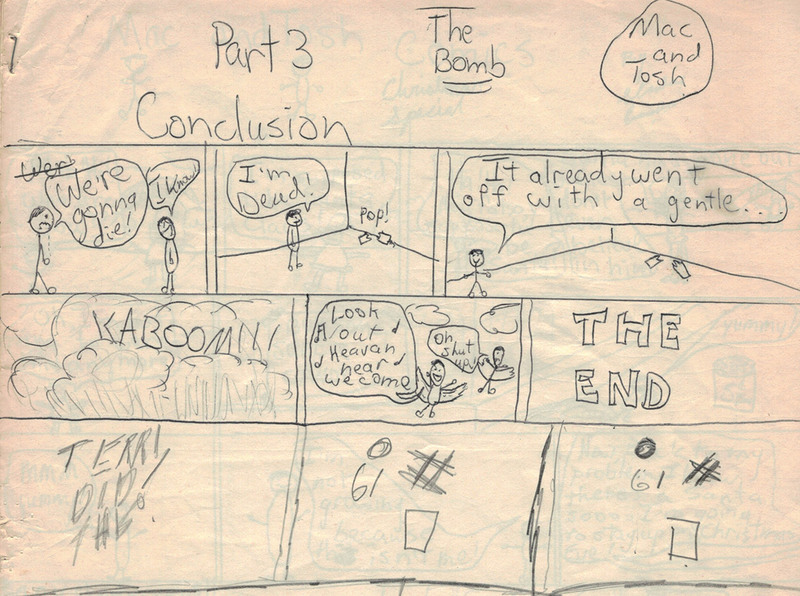 Here’s another scan from the rare, coveted Mac and Tosh comic book collection, of which there exists but a single copy (because I did not have access to a photocopier as an eight year old kid). This is a heartwarming Christmas tale. Or rather, it is a needlessly cruel Christmas tale, as it openly mocks Tosh’s belief in Santa Claus. The best part of the comic may be that it clearly identifies who Tosh is, ergo who Mac is as well. But there’s so much more. The world’s best Santa Claus costume. The public ridicule for believing in Santa and subsequent physical illness when being told the truth about the jolly old elf. The complete non-sequitur involving “super candy,” as if I had a panel quota to meet, the tantalizing cliffhanger. Read on and see, indeed. It was time to test out the scanner of the new multi-function Brother MFC-9130CW or as I like to call it, the heavy thing that sits on the corner of the desk behind me, so I grabbed a collection of Mac and Tosh comics I made when I was a wee one. As you will see below, my sense of humor was already suitably dark, albeit somewhat unsophisticated. The bleed-through is an accurate reflection of the thin and worn paper, hence I’ve made no attempt to fix it. I dated some of my earliest comics but not this series. There are several important clues, though. The lowercase “a” is written the “normal” way and I switched to the “fancy” version around the age of 10 or 11. The appalling spelling (“heavan” and “hear we come”) also indicates the period before I suddenly developed an internal spelling checker. I’m going to say I was around 8 or 9 years old at the time this epic was penned. Speaking of penned, I bravely inked the comic without drawing it in pencil first. Note the very first word was a mistake that I crossed out and corrected. Perhaps white-out did not exist back then. You can also see the classic “make a balloon then scrunch the words to fit inside it” technique favored by many budding comic strip auteurs. Sadly, Parts 1 and 2 seem to have gone missing. One can only imagine the tense build up leading to the eventual catastrophic demise of the characters. Also, I can’t recall which was Mac and which was Tosh. Their names are directly ripped off of the Goofy Gophers featured in Warner Brothers cartoons, of which I was (and remain) a big fan. At the time I probably thought of it as an homage. At least I didn’t also make them gophers. Their explosive deaths could have been inspired by one of many Warner Brothers cartoons but most likely something from the Roadrunner series. I like how either Mac or Tosh looks on the bright side even as they let slip their mortal coils. The last three panels are scratched in with pencil and I have no idea what the cryptic “TERRI DID THE” message refers to (Terri is one of my sisters). I also have no idea what the circle, #, square and 61 are references to or why they are repeated twice. It’s like clues to a murder mystery, but the only deaths I know of are in the panels above these would-be clues. Anyway, I’m going to recreate these strips to see how they’d look from an adult perspective. My guess is sad, but in a different and less-cute way. 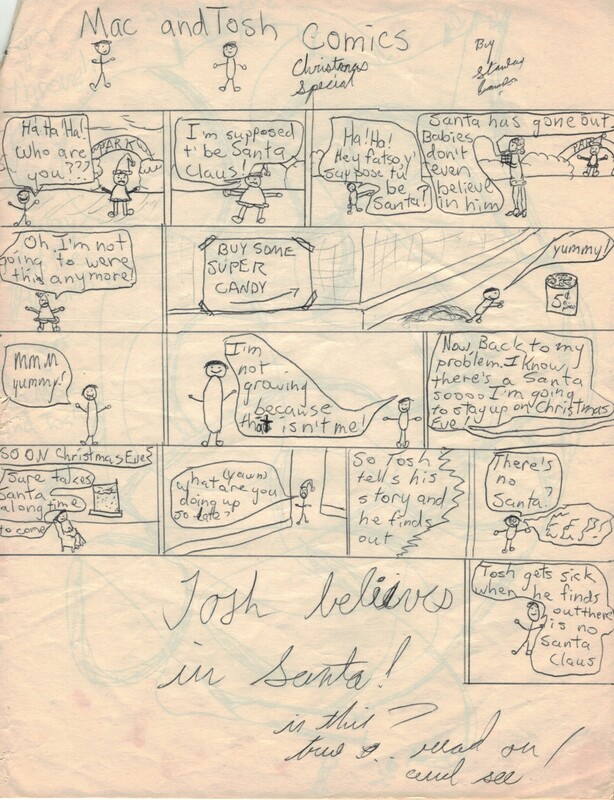 Way back when parachute pants were not worn ironically (or were still worn at all), I made a series of comics called The Ever-Continuing Saga of the Round Balls. I did 11 issues in all, each lovingly handcrafted by hand. The ongoing story was just a bunch of nonsense to allow for topical jokes and sight gags. 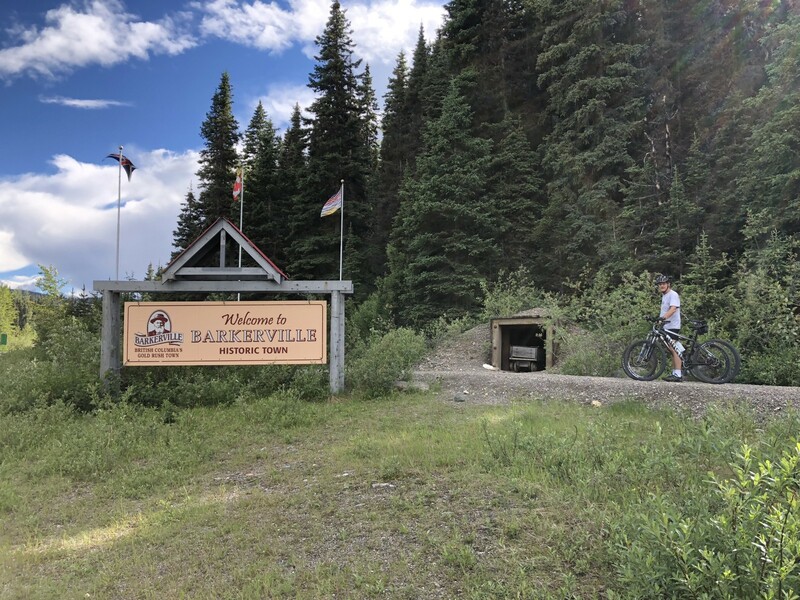 The balls were on a quest to find Pia Zadora. For people born in this century, she was the 1980s equivalent of Paris Hilton, more or less. The cast of characters was large and impressive. There were magic talking bean bags and mice, nefarious enemies in the form of rocks, adventures on tropic islands and more. I have lost all 11 issues. I have no idea where they are. It makes me sad. I tried to revive the comic about a year after the last issue but it never took. Below is a gallery of all that remains of those unfinished Round Balls comics. I’d say I’d go back and revive the comic except it was a lot of work and I ain’t no artist. But it was fun and satisfying at the time.